Our dough is ready to fry on the fly. As it turns out, you weren’t the only one in your group of friends craving beignets. As they suggest a few places to go for the fried puffs of heaven, you come up with an idea. 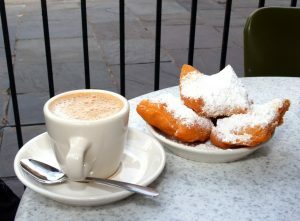 “Why choose when we can get beignets from two places?” Another friend nods. “Not a bad idea,” they say. So you make two stops. One at Shipley Do-Nuts, and one at another donut shop. The group gathers around a table and digs in. “Not as fresh,” you add, thinking about how beignets are like french fries. They are best enjoyed right after frying. Sure, you can eat them when they’ve been out a while, but would you want to? That’s why we keep our dough ready to fry on the fly. So you can get the freshest batch of the best beignets in Houston when you order. We use yeast dough just like Cafe Du Monde in New Orleans. Another friend takes a bite. They inspect the beignet as they chew. You take a second bite. Yep, your friend is right! Shipley’s Beignet texture is completely different. fluffier but full of crispy goodness. “Why is that?” you think. 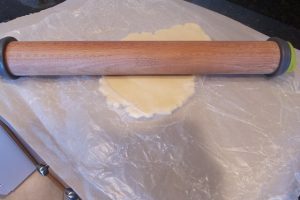 The difference has to do with the pastry dough. Often when people try to make the classic Cafe Du Monde beignet, they assume the recipe calls for a Choux dough. Choux (pronounced like the word shoe) originated in France and uses steam to create lift and openness in the dough. We use yeast instead. Why yeast? Because yeast helps expand and puff out the beignets by creating delicate bubbles of air and flavor. To get the ideal beignet texture, we start by taking our classic Shipley Do-Nuts dough and gently rolling it out for cutting. The frying comes next. 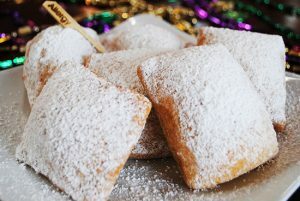 Add Some Beignet to Your Day! Using a low heat oil when frying can burn food. The last of your group takes a bite when they notice something. “Maybe it has something to do with the oil,” you say. You’re right! To properly fry a delicate donut like beignets, you have to use a high heat oil. High heat oils like canola and cottonseed are perfect for frying because they can withstand the heat without smoking. Lower heat oils, while great for drizzling over pasta, have a lower smoke point which makes frying harder to do. You’d have to fry at a low temperature to keep the dough from burning, or not fry the beignets for long, which can lead to uneven color and crunch. That’s why Shipley Do-Nuts uses an oil that can take the high heat. We know it’s the only way get our beignets golden brown and delicious. Order Some Houston Beignets from Shipley Do-Nuts Today! If you’re craving a taste of the French Quarter, call (713) 589-3292 or click below to order the best beignets in Houston today! Yes! Finally something about Toyota camry 2019. Hello to every single one, it’s really a pleasant for me to pay a quick visit this site, it contains helpful Information.